The Titans return home Sunday against the New York Jets. 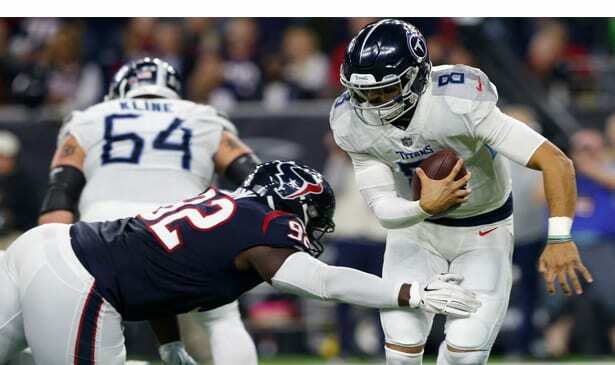 The Tennessee Titans fast start disappeared under an offensive surge by the Houston Texans Monday night as they dropped their second straight AFC South road game 34-17. The Titans’ record dipped to 2-2 in the division, and 5-6 on the season. Though four of the five remaining games are at Nissan Stadium, the team faces the task of winning out to have even a decent shot at the playoffs, as taking four of five and a 9-7 record probably won’t be good enough. The Texans continued their record streak, improving to 8-3, and becoming the first NFL team to win eight straight games after starting a season 0-3. The Titans early looked in command. They jumped ahead 10-0, getting a 31-yard field goal from Ryan Succop and a 61-yard touchdown reception from tight end Jonnu Smith. But the Texans came back and grabbed a 14-10 lead. Then the game turned completely around on two key plays. First came a curious Titans call on fourth and one from the Texans’ three-yard line. They opted for a run by tight end Luke Stocker rather than either a QB sneak by Marcus Mariota or a straight-ahead run by Derrick Henry. Stocker was stuffed and the Texans took over on downs. On the very next play Houston running back Lamar Miller exploded through a hole and raced 97 yards for a touchdown, making it 21-10. The Titans got within ten points at 27-17 on another 48-yard Mariota touchdown pass to Corey Davis, but were unable to prevent Houston from getting a clinching touchdown. Demaryius caught his second scoring pass, a 10-yarder, for the final points. Tennessee is second from the bottom among NFL teams in scoring offense, and they hit their 17-point average. Mariota had a near record settiing night in terms of completion percentage, completing 22 of 23 for 303 yards and two scores. But the vast majority of those passes were underneath or short routes. Other than the two touchdowns, the offense was mostly unproductive. Meanwhile the defense was surrendering 283 rushing yards, a franchise record for the Texans. Miller is the only player in NFL history with two career rushing touchdowns of 95 yards or more. Deshaun Watson had 210 yards passing and two touchdowns, while adding a third on the ground. He’s thrown 39 touchdown passes in his first 18 games, third in NFL history behind Kurt Warner and Dan Marino. Miller ended with 162 yards on 12 carries, plus his touchdown run. Davis had another solid game with 96 yards in receptions and a touchdown. The Texans honored recently deceased owner Bob McNair in a pregame ceremony.